Hi all..... so one of the things that I've decided to do craft wise this year is to try some new techniques. So when I saw the current challenge at Magnolia Mania I thought "why not". Since I have always stayed away from the thought of coloring my image in nothing but a black and white theme this was a big challenge for me. I definitely have some work to do to improve, but I'm very excited about how my very first shot at this turned out. To create my card I started with a black card base. I cut a piece of white card stock slightly smaller than the base and inked around the edges with a black stamp pad. 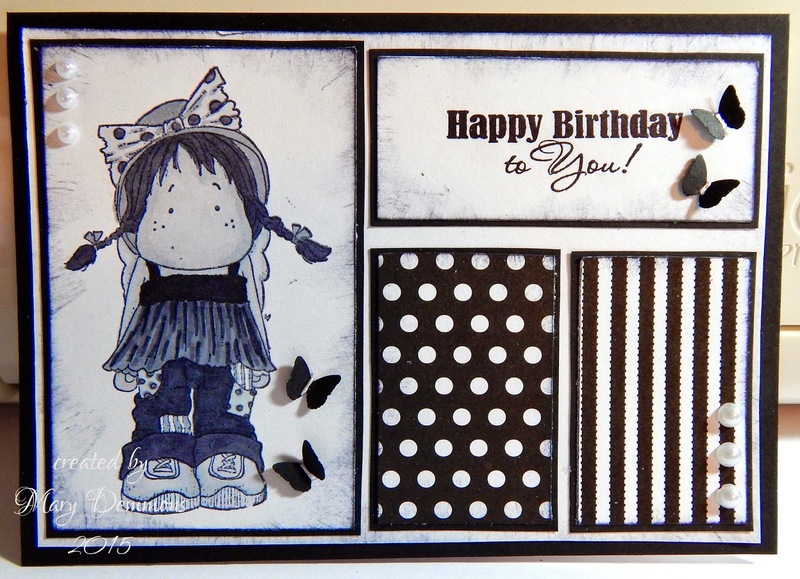 I cut a piece of black and white striped card stock, inked the edges and backed it in black. I did the same with a piece of black and white dotted card stock. I stamped the sentiment on white card stock, inked around the edges and backed it in black card stock. I colored the image using different shades of gray Spectrum Noir pens. I then inked around the edges and backed it in black card stock. I punched 4 small butterflies out of black card stock using a butterfly punch from Martha Stewart. I added liquid pearls to the center of each butterfly and added 2 to the image and 2 to the sentiment. I also added 3 snowflake pearls to the corner of the image and 3 more to the corner of the striped card stock. This is really striking, Mary! Your monochrome colouring is so clever! Thanks for joining in at Dream Valley!